SunEdison's apparently looming downfall is a black eye for the renewable energy industry, but longer term, it may be good for the solar developers left standing -- and for investors. It's now all but confirmed that SunEdison (NASDAQOTH:SUNEQ), which dubbed itself the biggest renewable energy developer in the world, is going to go bankrupt. This week, its subsidiary TerraForm Global even said there was "substantial risk that SunEdison will soon seek bankruptcy protection." If that bankruptcy happens, there will be a cascade of repercussions for the industry. Here's what to watch out for, and how it would affect investors. It's almost inevitable that those who are anti renewable energy will declare SunEdison's downfall a sign that the industry is doomed. What this fails to take into account is that SunEdison isn't failing because its technology doesn't work; it's failing because it took on too much debt and bid too aggressively for new energy power purchase agreements. Companies like SunPower (NASDAQ:SPWR) and First Solar (NASDAQ:FSLR) have created very profitable businesses building large solar projects, and they didn't overleverage their businesses, so they aren't in trouble. They also have differentiated technology, something SunEdison doesn't have. The narrative that renewable energy is failing and SunEdison's woes are a sign of that is just not correct. 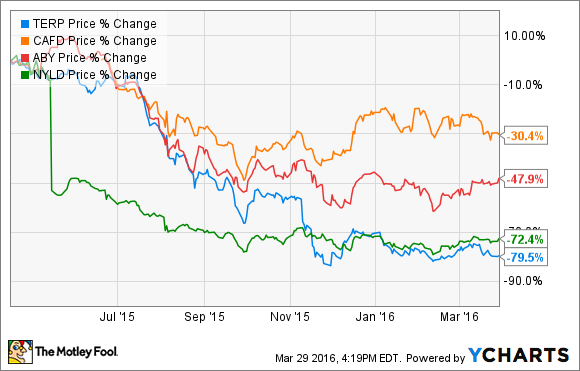 SunEdison failed in part because the growth opportunity is so large in renewable energy. Management just forgot that executing on projects is key and relying heavily on financial engineering isn't a path to long-term success. The bigger effect on the renewable energy industry will be one of its most aggressive developers folding and taking down the yieldco market with it. The loss of SunEdison may make it easier for other large developers like SunPower, First Solar, and Canadian Solar (NASDAQ:CSIQ) to win projects with attractive financials. Abengoa has already filed for bankruptcy, so big players are dropping out of the market at a rapid rate. The yieldco market could be an even longer-lasting negative for renewable energy companies. Yieldcos were supposed to be able to access public markets to fund an ever-growing number of renewable energy projects around the globe. But as you can see below, yieldco stocks have dropped, and as dividend yields in the industry rise, it becomes harder to finance projects. There's still a lot of appetite for renewable energy projects, but more than ever, utilities and financiers will look for quality players to be counterparties. In renewable energy, there are really two key components for developers. First, they need a utility, business, or homeowner to buy energy from them through a power purchase agreement. On the utility side, where most installations take place and where SunEdison was a big player, customers want to know when a project will be completed, and to have reliable energy production, as well as a consistent counterparty they can count on. SunEdison failed on all counts, which will likely make utilities put a greater emphasis on finding consistent developers in the future. Equally important is the financing piece, which is often called bankability. Renewable energy owners don't just pay cash for a power plant and let it sit on their balance sheet. They typically use leverage through bonds, securitization, or other forms of debt. Debt holders are all about risk, and if a company can't complete a project on time and on budget, and generate energy on plan, those debt holders are going to back out or demand a higher interest rate. As interest rates go up, the developer has to charge more for energy, making it less competitive. All of these factors point to both customers and financiers putting a premium on bankable, reliable developers. The two with the longest histories and (arguably) best performance are First Solar and SunPower, and I think they will be major beneficiaries of SunEdison's demise. Investors may look at them more skeptically in the short term, but in the long term, their businesses will likely see higher margins and greater demand because they're reliable. While SunEdison will be be a black eye on the renewable energy industry for a short time, it'll likely lead to even bigger profits for the best developers in the industry, like SunPower and First Solar. They're already preferred partners for utilities and financiers, meaning they can offer lower rates for electricity while earning higher margins. The companies that will be interesting to watch are middle-market developers like Canadian Solar's Recurrent Energy that have built large backlogs in the past, but don't have the same history or balance sheet that utilities or banks might prefer. We'll also have to see if the decline in yieldcos makes financing projects more difficult, or if developers just find new buyers. It may be the financing market that's hurt the most by SunEdison's fall and the decline of yieldcos, which were supposed to be the new financing mechanism of choice for developers. As always, it's best for investors to buy the best renewable developers with the best balance sheets, because those with subpar histories have a higher likelihood of failure.